Once each year at the end of January, an amazing economic development activity erupts in Utah. 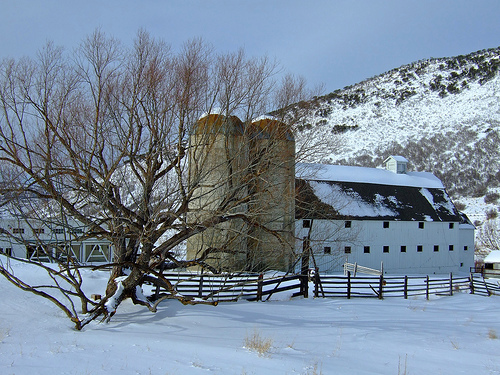 Founded by actor, Robert Redford, the Sundance Film Festival is an incredible combination of art and tourism. I’ve been coming here for at least nine years to indulge in the creativity of independent screenwriters, actors, directors and producers. So far this year, I’ve seen a handful of good films, a couple that didn’t meet my expectations and my next day is planned with a few more. I’ve also stumbled across a much much smaller, grass roots economic development activity within the food space. ﻿Slow Food Utah has a micro-grant program designed to fill the gap in traditional funding sources for local food-related projects. Once each year, Slow Food Utah holds an event called the Feast of Five Senses. I’ve recently become familiar with the five senses concept via another great blog from In My Box. The Feast of Five Senses is held as a fundraiser and the net proceeds are designated for Slow Food Utah’s micro-grant program. So, how does the micro-grant program work? The program is open to any individual, small business, or non-profit committed to the Slow Food International principles of good, clean, fair food, cultural diversity, and convivality. Slow Food Utah gives high priorities to projects that help increase or enhance local skills and capacity, the availability of locally produced foods, regional and cultural food traditions, and taste or youth education. I’m immediately attracted to their concept and my mind is spinning with ideas that might’ve passed muster in this annual competition for grants. Ajo Cooks? Crockpot Camp? Ten Recipes? A Community Garden? Funding to cover travel costs to attend a special conference about sustainable agriculture that relates directly to your business, teaching, or education (e.g. Eco-Farm http://eco-farm.org/index.php/efc, American Grassfed Association http://www.americangrassfed.org/). Funding to purchase seeds and equipment related to producing a new crop or breed of livestock, especially if it is on the Ark of Taste, part of a Presidia, on the American Livestock Breeds Conservancy Priority List http://www.albc-usa.org/cpl/wtchlist.html, open-pollinated/heirloom, a food important to the cultural traditions of native or immigrant communities in Utah, or otherwise a local food crop or tradition at risk. Funding to address a sustainable projects at a farm or operation such as energy efficiency, transition to certified naturally grown, organic, or biodynamic (including initial certification costs) or invest in equipment that will enhance your direct-market opportunities. Funding to help develop an urban garden or micro-farm as a community development or educational program. I’m certain that I possess a certain degree of unrealistic romanticism but I love the concept of holding a fundraiser and then creating a grant program from the proceeds. And if the grant program assists in the development of the local food movement, what could be better? I have a secret goal of starting either a Slow Food chapter or another kind of local food group here in my area; we’re the only part of New Hampshire without some sort of organized effort. These are great program ideas. Thanks so much for passing them along. Regarding unrealistic romanticism… seems to me that the world is a better place because of people with that particular quality. Keep it up! Thanks Eleanor and I think you would be perfect to initiate an endeavor like that. Be on the look-out for similar activities your way. I’ve been trying to read up on all sorts of interesting projects like this. You are a good lady, Tammie! Thanks George. It’s such a treat for me that you read this blog. Well, I hate to disagree with your word choice, Tammy, but it sounds more like “realistic romanticism” to me. Maybe I need to hold a grass roots fundraiser here in Florida to fund grass roots efforts. I love it Nancy. Maybe I’ll come to it! As the angels would have it, I was just thinking of you in the middle of a good read I will pass on to you and your readers. Susan Davis offers a free eBook I’m sure will spark your passion for stewardship and innovation. http://thetrojanhorseoflove.com/susandavis/ Download it from the margin links next to her bio. Check it out and give me a call. You won’t believe what UrbanLab is up to these days! Too much fun! I will check out the link and look forward to connecting. *envy* Hoping my son gets accepted to UC Boulder so that I have impetus to get out to that part of the country. That is where I did my undergraduate work Jane! How wonderful that you can be a part of these two vibrant cultural movements! It’s interesting how much of these (smaller) endeavours have to rely on funding to survive. In a perfect world, we could just slice off some profits from big corporations…. And it would be interesting to know what the tipping point is when the endeavors become viable. Great to learn about more and more of these sorts of projects and activities “cropping” up about the continent. What a wonderful initiative, I wish that happened in South Africa! I have read about the fabulous dinner parties that you do Cindy! Maybe you can be the catalyst. Tammy, you can absolutely do it. Last year, after the “1000 Year Flood” in Nashville, we put together a fundraiser through the Community Food Advocates and raised $16,000 to assist local farmers who experienced devastation from the storm. It all happened really fast, and Whole Foods got on board. It became a mini-grant program, distributing funds to farmers who applied. At our community potluck, we have simple “Pass the Plate” to raise $ for the Community Food Advocates to further their work healthy food accessibility. Do something and you’ll be amazed at how many people will step up to help. How great Nancy! Is that part of a slow food group or something that you have created on your own? Fantastic! I hope I can get down there one of these days and see what you’re doing! Great ideas, love the thoughtfulness that went into establishing these programs. I’m excited to learn about how to get a few of these going in my own community. Tammy, every time I come to this site you open my mind just a little more. That’s truly a gift. Not many blogs can pull that off. Thank you! That’s a wonderful compliment Ollin. Thanks so much.